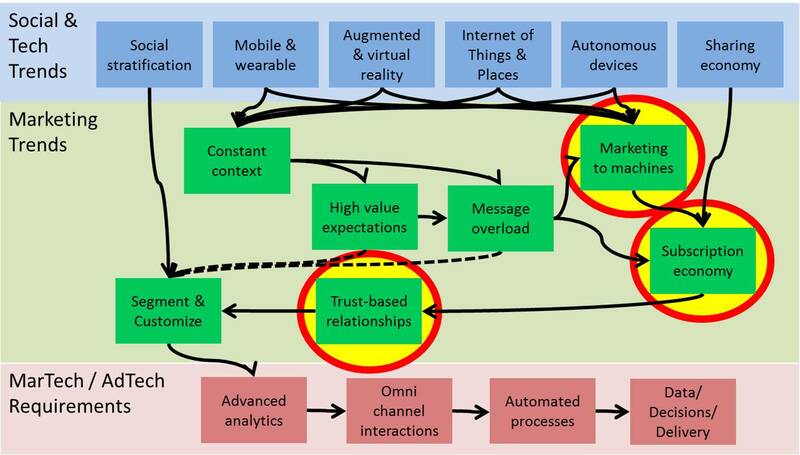 Customer Experience Matrix: Future Marketing: Will Machines Take Over Half the Consumer Economy? Future Marketing: Will Machines Take Over Half the Consumer Economy? ‘Tis the season for predictions. I’m not going to plague you with any new ones right now, but did want to expand a bit on the long-term vision I’ve been talking about in speeches and described briefly last July as “robotech”. The gist of this is that people will increasingly delegate day-to-day decisions to computers, meaning that most purchases will be based on machines selling to other machines. (If you want a real-world example, think how search engine optimization already boils down to “selling” content to the Google ranking algorithms). In this world, consumers still have choices but what they’re deciding is which machine to trust – in exactly the same way that you decide whether to let Google or Bing or something else be your primary search engine. The key word in that sentence is “trust”. People won’t want to double-check each action by the agents they delegate to buy their groceries, pick their restaurants, book their hotel rooms, arrange their transportation, and do other boring daily tasks. The chart below shows in more detail how I think current trends lead to this conclusion; I won’t bore you by walking through it step-by-step. One question worth asking is, how much of the economy is likely to be affected by this change? After all, nearly all B2B purchases are already part of a larger relationship rather than isolated transactions. On the consumer side, large sectors like banking, insurance, health care, and housing are also governed by long-term contracts. The table below shows a crude attempt to find an answer. 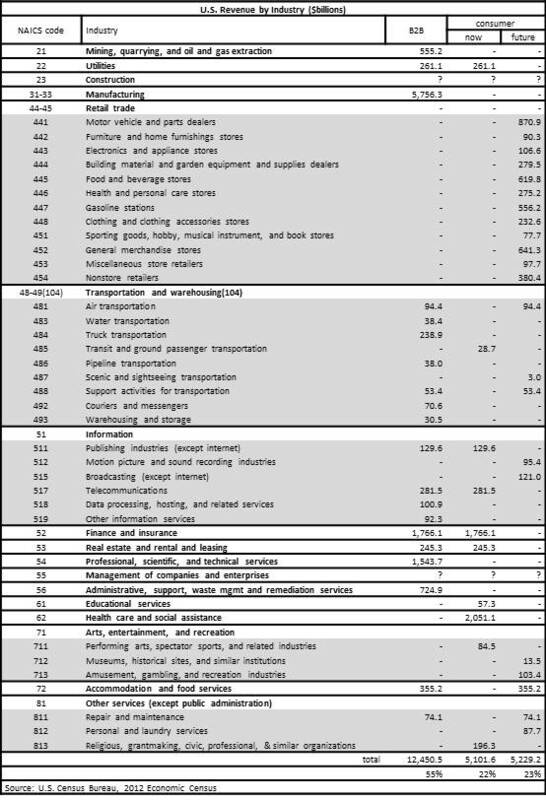 Using Census data, classified each industry as B2B or B2C, and then split B2C between sectors that are already purchased through long-term relationships and those that will move to such relationships in the future. (I did actually have a category for those that will remain transactional, but that column ended up blank.) Industries that sell to both business and consumers were split 50/50. I told you this was crude. As you see, I decided that about 55% of the U.S. economy is B2B. The remaining portion is split evenly between sectors that are already sold through long-term contracts and those that will make that transition in the future. The bulk of the change will happen in the retail sector, where I think nearly every purchase will be based either on a direct subscription – such as contracting with a dealer to service your car rather than buying each repair individually – or an indirect subscription – such as having an automated travel agent pick the best airline, hotel, rental car, and restaurants for each trip. You might question some of my choices, but let me point out that even the clothing industry – where people theoretically want to make individual choices – is already seeing subscription business models where companies send products they think the consumer might like and the consumer can then keep what she wants. These figures are intended to give some weight to my otherwise vague assertion about the shift from transactional to relationship buying. If literally half the consumer economy is at stake (and the other half has already made the transition), that is surely worth paying attention.